Bonhomme’s winterland is Quebec city winter park setup in downtown at the Plains of Abraham. 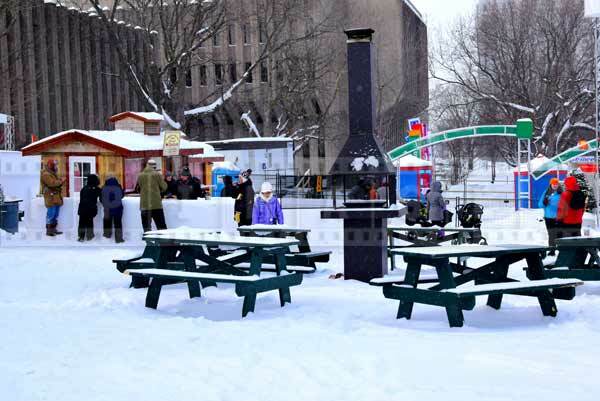 This winterland is part of Quebec city winter carnival and is full of fun outdoor winter activities. There are things to do for all ages and of course everybody gets hungry and thirsty after being outside for a long time. 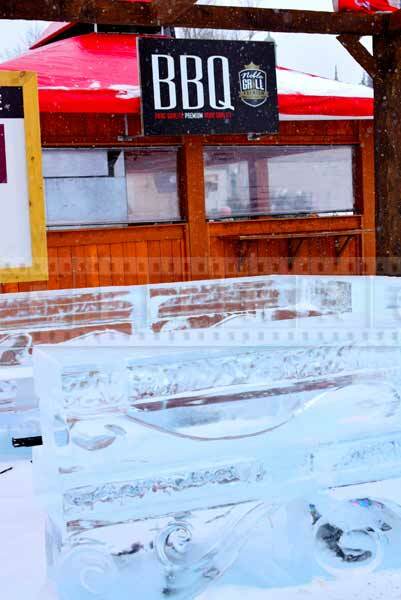 Bonhomme’s winterland street food has traditional fair food like fries and burgers inside of tents. People can take a break inside from the cold weather and from all the winter activities. 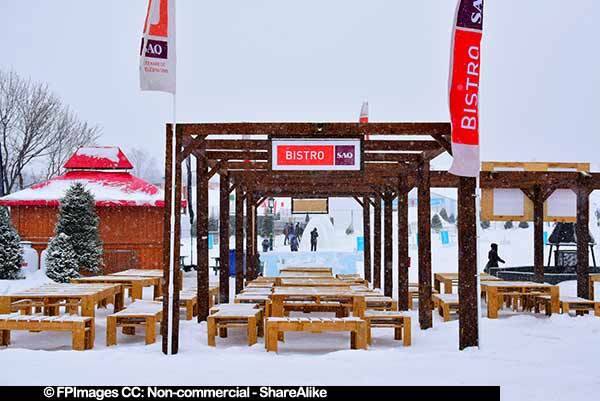 Street food at Bonhomme winterland also offers a choice to brave the frost and eat outside. This option may appeal to some because if you dress warmly for being outside in -20C, you will not be too comfortable in a tent wearing all this clothes. Also why not try something different and have a winter street food picnic. Bonhomme’s winterland attractions include trout ice fishing. What is different about this trout ice fishing is that they will prepare the fish that you caught. 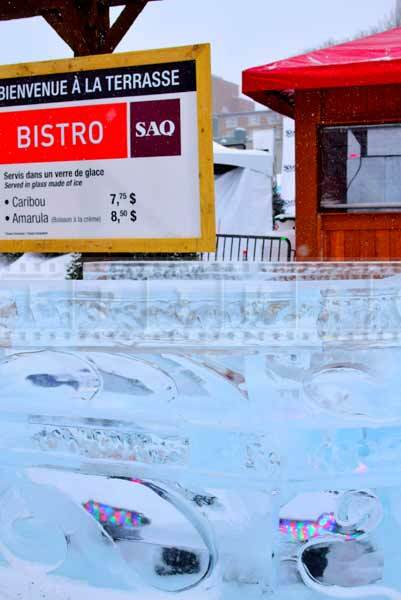 Bonhomme’s winterland takes place every year from January 29 to February 14. Since this is very cold time of year in Quebec temperatures never rise above freezing. 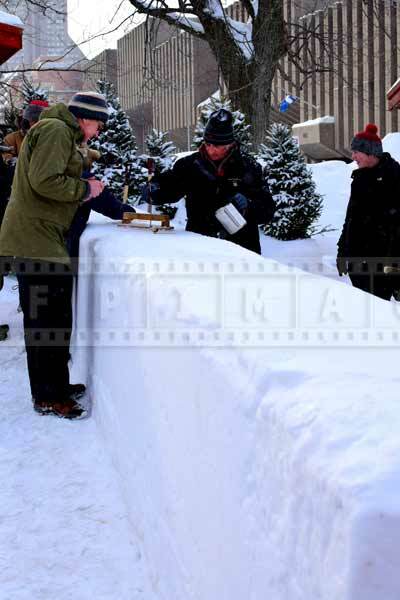 That allows organizers to have many ice and snow sculptures. Street food establishment use this to their advantage and you can see many bars made with ice and have a drink from an ice glass. Bonhomme winterland also features a maple sugar shack (Cabane a Sucre). This is a must visit street food place to try Canadian maple syrup treats and take home nice maple syrup bottle or other sweet delicacies. 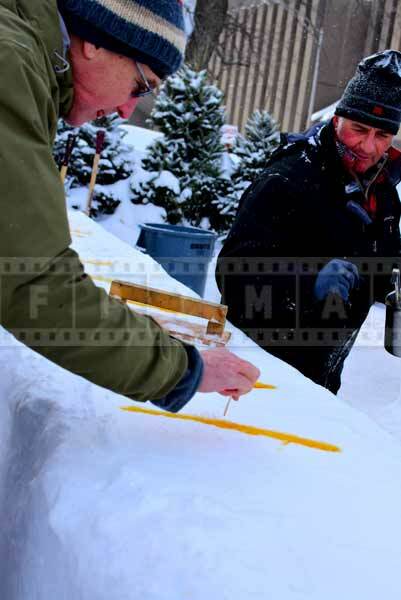 Maple sugar street food shack sets up a rectangle wall of fresh snow. 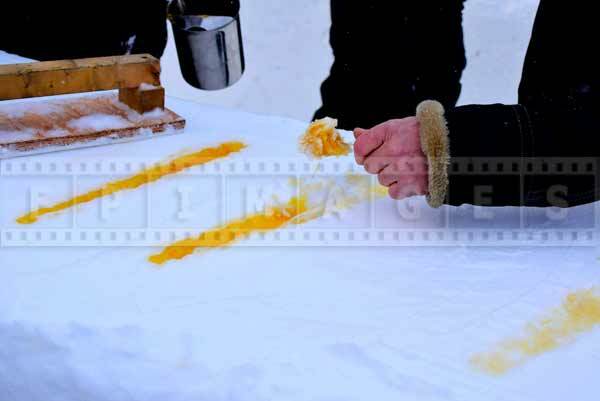 Then they proceed to pour fresh hot maple syrup right onto the snow surface. Maple syrup freezes immediately into a delicious candy strip. Then using a provided wooden stick you roll this maple sugar strip into your own hand made unique candy. 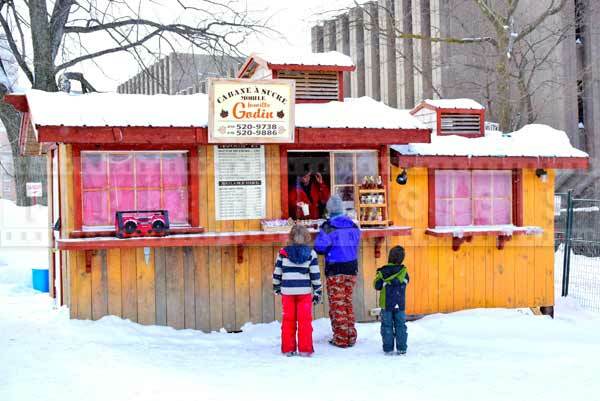 Bonhomme’s winterland street food of course offers Canadian favorite – beaver tails. This is a nice treat on a cold winter day. 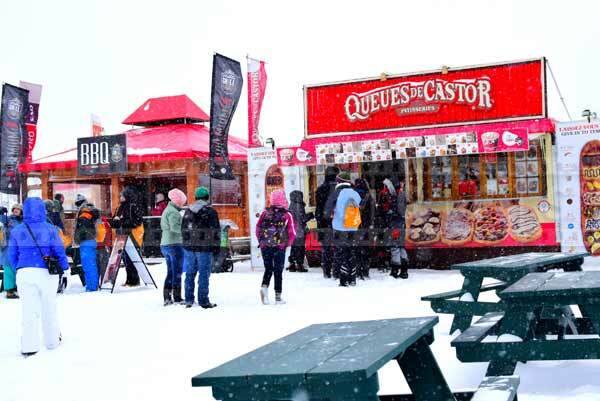 Beaver tails (Queues de Castor) are fried dough pastries that are very popular. This is favorite street food snack in Canada. Beavertails are served hot and have various toppings. The classic flavor of street food treat is considered cinnamon and sugar. 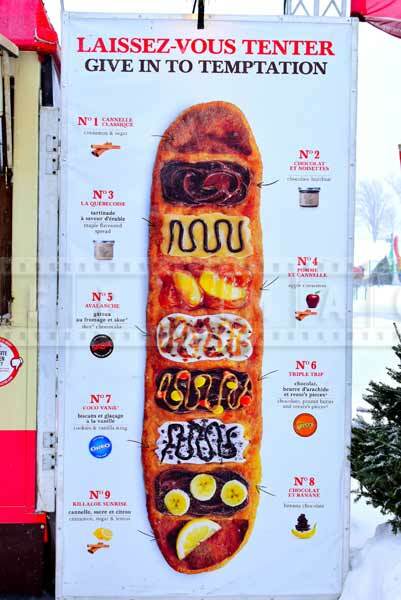 The beavertails kiosk at Quebec winterland offers toppings such as maple syrup, chocolate hazelnut, apple cinnamon and others. You can always come up with you own favorite combination. 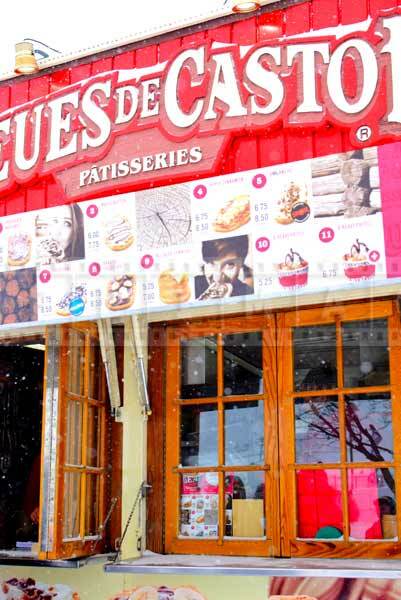 Quebec city, Canada Bonhomme’s winterland street food is an excellent way to experience French Quebec and Canadian food. It will fill you up and make want more.